Tattoos are injuries to the skin. Your bodies immune system only has a finite amount of energy to dedicate to healing itself and so it is very helpful to healing a tattoo if you are otherwise in good health. If you have recently suffered injury or illness, it may be best to avoid getting a tattoo until you have fully recovered from the previous incident. If, for example you have a broken arm and also get tattooed, your body will have to divide its efforts to heal itself between the two injuries and BOTH will heal more slowly. Avoid exertion, intoxicants, and stress. Rest as much as possible, and eat a nutritious diet to give your body the best possible conditions to heal the tattoo as quickly and as easily as possible. Once the pigment has been placed, the skin will be slightly swollen, hot, tender, and may be weeping blood plasma. This is due to the fact that the skin has been subjected to many hundreds of thousands of tiny punctures. The swelling is due to the bodies immune response of an increased blood flow to the area. The warmth is due to the increased blood flow, as well as the immune system cranking up the temperature in order to fight off infection. (the more often you wash a fresh tattoo, the faster it will heal). Some of the pigment is flushed away in the capillaries and deposited in the lymph glands. As the body gets to work repairing the damaged tissue, it creates a mesh of platelets to stop fluid loss. 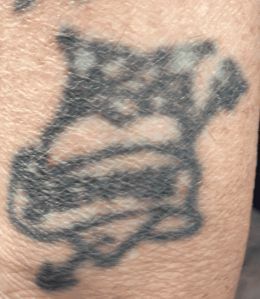 Much of the tattoo pigment gets caught within this mesh, which later will become the scabs, or flakes of the peeling tattoo. Any pigment grains which are too large to be washed away in the capillaries will be encased in collagen to isolate them from the blood. Over the course of a week or two the body will be repairing the skin where the tattoo has been applied. This includes a sloughing off of the dead or dying layers of skin that the tattoo was placed beneath, and repair of the layer of skin that will contain the tattoo itself. The process of tattooing the skin is thought to interrupt the skins natural production of oils, which is why it is very important to moisturize the tattoo regularly. DO NOT OVER-MOISTURIZE as this will clog the pores, cause rashes or pimples, dissolve the delicate platelets and re-open the tattoo causing the oozing of more plasma which will result in more severe scabbing. Try to simply maintain a moisture level consistent with the parts of you that are NOT healing a tattoo. 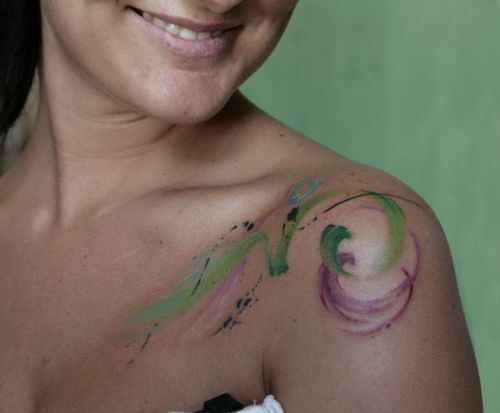 Over time the skin looses collagen and elasticity, which causes the tattoo to blur and fade. Black will ALWAYS be the last color to fade away. This is why it is very important that tattoos include strong OUTLINES and HEAVY black shading. Without a solid foundation in BLACK pigment, the tattoo will become un-readable over time. It is generally accepted wisdom within the tattoo community that a tattoo should look good, and be easy to interpret with the black pigment alone, for this reason. *this is why very pale, water-color style tattoos and tattoos with no black or no outline are frowned upon by seasoned tattoo artists. 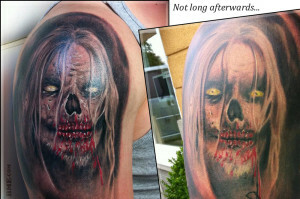 The problem with these types of tattoos is that they look really impressive when they are brand new, the photos of them are shared, and subsequently are seen and requested by throngs of uneducated collectors. Uninformed or irresponsible tattooers perpetuate the problem by agreeing to do these tattoos, and the issue persists. Years from now there will be a large number of very unhappy tattoo collectors as the colors fade from their work and they are left with an ugly remnant of what was once an “artistic triumph”. Click HERE for another good read on this topic. Do yourself a favor and DONT GET TATTOOS LIKE THIS. She will NOT be smiling about this tattoo in ten years.